This cover is a good example of how I sometimes have to add to an image to make a cover work. I don't like to do it if I don't have to, and when I do, I try only to add what the original artist might have anyway to maintain the integrity of the art. In this case I was trying to find a usable image of Chaselon, but there aren't a whole lot out there. Still, I love the character and wanted to use him again, so I found an image that I could build on to. it took some cutting and pasting and use of the clone stamp and color change tools, but I got it to work. 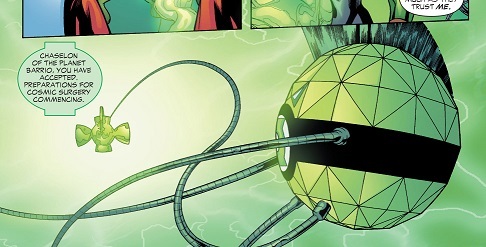 Chaselon reminds me of another Green Lantern, Mogo, a sentient PLANET! I can just see Deadpool impersonating GL Hal Jordan, gazing into one of Chaselon's optical facets, and chanting (in his best Maria Ouspenskaya accent): "I see a short blue stranger entering your life!" 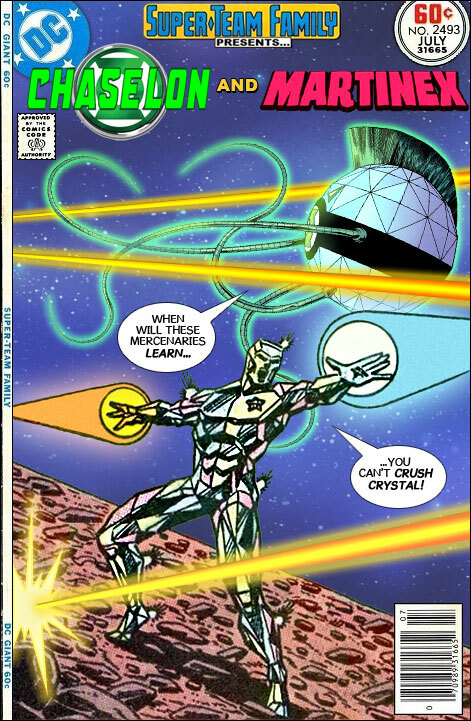 Chaselon's in the new Green Lantern series, but Grant Morrison insists on calling him "Chriselon". Remember: Grant Morrison is just a New Age iconoclast. Nuff said! That or Amethyst, Princess of Gemworld and Amethyst of the CGs"
How about Amethyst, Princess of Gemworld, teams up with Crystar, Crystal Warrior? Hurray for Martinex, Goobers & Snowcaps too. Hurray for Martinex!